Heart failure remains a major public health concern because of its high prevalence, morbidity, mortality, and financial burden. The poor clinical outcomes associated with acute decompensated heart failure, suboptimal efficacy and safety profile of conventional treatment regimens, and unsatisfactory experiences with the newer classes of pharmacologic therapy underlie the interest in the use of extracorporeal isolated ultrafiltration in this setting. In this article, selected mechanistic aspects of ultrafiltration therapy are briefly reviewed followed by a critical overview of the largest trials in this field. I will discuss the clinical relevance of renal dysfunction and decongestion as two commonly used end points of safety and efficacy in the ultrafiltration trials, with emphasis on the emerging pertinent notions that could challenge our conventional thinking. Finally, a number of practical recommendations (e.g., customization of ultrafiltration rates) are provided for ultrafiltration therapy in the setting of acute decompensated heart failure. Because of a paucity of evidence, universally accepted consensus guidelines cannot yet be generated. As such, when considering ultrafiltration therapy for acute decompensated heart failure, the likely benefits should be carefully balanced against the potential risks for an individual patient. A conceivable implication of the ultrafiltration trials is that collaborative heart failure programs benefiting from nephrology expertise and resources could improve the outcomes and reduce the cost. Heart failure (HF) is a major health care concern because of its high prevalence, morbidity, mortality, and cost of care. It is one of the most common chronic conditions in the United States, with a lifetime prevalence reaching 20%–33% (1). Currently, >5 million Americans suffer from HF, and this number is expected to rise to >8 million by 2030 because of the increase in the aging population as well as the improving number of patients surviving ischemic events (2). Acute decompensated heart failure (ADHF) remains the leading cause of hospitalization in patients >65 years old and has the highest rate of 30-day rehospitalization among all medical conditions (3,4). Despite major advances of the past decade in the care of patients with chronic HF, little progress has been made in the treatment of ADHF as illustrated by the 1-year mortality rate of >30% (5,6). Diuretics have long been the mainstay of therapy. Other than untoward effects, such as diuretic resistance and variable dose-response rate, studies have shown suboptimal efficacy of conventional regimens for treatment of congestion in ADHF. Nearly 40% of these patients still have congestive symptoms at the time of discharge, and nearly one half of them lose little weight (i.e., 0–5 lb) or even gain weight during the hospital stay (7). In the Diuretic Strategies in Patients with Acute Decompensated Heart Failure (DOSE) Trial, 42% of the patients treated with diuretics reached the composite end point of death, rehospitalization, and emergency department visit within only 60 days of discharge (8). Over the past decades, other classes of medications, such as vasopressin and adenosine-A1 receptor antagonists, have been developed to treat congestion in ADHF, but so far, they have failed to reduce HF events, protect renal function, or improve survival (9,10). The high prevalence of HF and its financial burden, the excessively poor outcomes of patients with ADHF, the suboptimal safety and efficacy profile of conventional diuretic–based regimens, and the unsuccessful experiences with the newer classes of pharmacologic therapy underlie the increasing interest in exploring alternative methods of decongestion, such as extracorporeal isolated ultrafiltration (UF). UF therapy was initially explored in a series of interesting studies in Europe trying to elucidate its underlying mechanisms of action in the setting of ADHF, while simultaneously exploring its cardiorespiratory effects (11–13). Because exacerbation in neurohormonal activity is considered a key pathway in development, progression, and prognosis of HF, it was the focus of several UF studies. An elegant study by Guazzi et al. (14) showed that a significant reduction in plasma volume through UF therapy can lead to a paradoxical decrease in neurohormonal activity. Diuretics do not portend such benefit and even tend to produce opposite effects (15). UF is associated with a progressive decline in right atrial and pulmonary capillary wedge pressures and an increase in stroke volume and cardiac output without an adverse effect on heart rate, BP, or systemic vascular resistance (11,16). Sustainability of the beneficial neurohormonal and cardiorespiratory effects beyond the duration of therapy is also an intriguing finding of these studies. For example, in a randomized, controlled trial (RCT) by Agostoni et al. (12), one single session of UF was associated with significant improvement in several respiratory parameters that lasted 6 months after the treatment. It has been suggested that the post–UF–enhanced natriuresis (possibly because of improved intrarenal hemodynamics) and the inherent ability of UF for greater sodium removal per volume extracted (i.e., isotonic ultrafiltrate versus hypotonic urine) could contribute to this observation (11,14). The first generation of UF studies not only shed light on certain conceptual and mechanistic aspects of this therapy but also pointed to UF as a plausible alternative to conventional treatment of ADHF. Proposed advantages of UF are summarized in Table 1. At the turn of the century, UF was being used mainly for a subset of patients with ADHF and lingering congestion despite aggressive medical treatment. The relative complexity of this therapeutic modality compared with inexpensive, readily available, diuretic–based pharmacologic regimens coupled with a lack of large–scale multicenter trials hindered its widespread use. In the early 2000s, there was a renewed interest in this therapy because of the advent of the user–friendly portable devices that are dedicated to UF, use low–blood flow rates, and do not mandate admission to higher–level care units. A number of small clinical studies further established the practical aspects of this therapy, such as feasibility of using peripheral veins and safety of higher UF rates, while also revealing some of its drawbacks (Table 2) (17,18). They set the stage for the second generation of UF studies that were mainly carried out in the United States and included large multicenter RCTs. These studies have previously been reviewed by the author in detail; herein, the focus will be on the four most recent larger trials (19). The Ultrafiltration Versus Intravenous Diuretics for Patients Hospitalized for Acute Decompensated Heart Failure (UNLOAD) Trial is the first landmark study in this field (20). It compared early UF (i.e., randomization within 24 hours of admission) with a conventional diuretic–based regimen in 200 patients with ADHF. The investigators found greater weight loss in the UF group (5.0 versus 3.1 kg; P=0.001) at 48 hours without an apparent adverse effect on renal function or BP. Moreover, patients in the UF group experienced fewer HF hospitalizations as well as fewer unscheduled office and emergency department visits. One major shortcoming of this trial was that the improved outcomes in the UF group could also be attributed to better decongestion, because their net fluid removal was significantly greater than that of the standard therapy group (4.6 versus 3.3 L; P=0.001; see below). It took >5 years for the second largest RCT in this field, the Cardiorenal Rescue Study in Acute Decompensated Heart Failure (CARRESS-HF), to be published (21). In this National Institutes of Health–sponsored study, 188 patients with ADHF who also presented with worsening renal function (WRF) and persistent congestion were randomized to receive either an algorithm–based pharmacologic regimen or UF as a rescue therapy. Surprisingly, UF was found to be inferior to pharmacologic treatment, mainly because of deterioration in renal function (0.23-mg/dl increase in serum creatinine for UF versus 0.04-mg/dl decrease for medical therapy; P=0.003), despite similar weight loss (5.7 kg for UF versus 5.5 kg for medical therapy; P=0.58). The investigators did not find any significant difference in the mortality or rehospitalization rate between the two arms. Beyond comparison of UF with pharmacologic therapy, an interesting aspect of the CARRESS-HF was emergence of an extremely efficient pharmacologic regimen resulting in significant diuresis (i.e., 2.8–3.4 L/d) without negatively affecting renal function or BP (nearly one half of these patients received treatment with metolazone in addition to loop diuretics) (21). In contrast, one major shortcoming of this trial was that it had no measures in place to ensure optimal volume extraction in the UF arm: it was delivered at a fixed rate of 200 ml/h, and 30% of the patients had to receive intravenous diuretics after UF therapy before the 96-hour time point. After a myriad of positive trials, the unexpected findings of the CARRESS-HF were sobering and underlined the need for more robust data before widespread use of UF for ADHF could be advocated. Subsequently, the largest European RCT, the Continuous Ultrafiltration for Congestive Heart Failure (CUORE) Trial, compared the efficacy of early UF with conventional pharmacologic therapy in 56 patients with ADHF who presented with fluid overload and significant weight gain (i.e., ≥4 kg in the preceding 2 months) (22). The primary end point was the incidence of HF rehospitalization. In contrast to most other studies, withholding medical treatment (including diuretics) was not required for patients in the UF arm; the treating physicians were encouraged to apply both therapies simultaneously. Despite similar weight reduction in the two arms (7.5 kg for medical therapy and 7.9 kg for UF; P=0.75), a significantly lower incidence of HF rehospitalization was observed in the UF group during the 1-year follow-up (hazard ratio, 0.14; 95% confidence interval, 0.04 to 0.48; P=0.002). Overall, the patients in the UF arm were found to remain clinically more stable than those in the control group; body weight, renal function, and the dose of diuretics remained unchanged at 6 months compared with the hospital discharge for the UF arm, whereas increases in body weight, serum creatinine, and the dose of furosemide were observed for the medical treatment group. The study protocol of the CUORE Trial resembled the UNLOAD Trial, in that randomization took place early, WRF was not required, medical therapy was not protocol driven, and UF treatment was customized to clinical characteristics of the patients (a wide range of UF rates from 168 to 485 ml/h was used, with a mean treatment time of 19±10 hours). Both studies showed significant improvement in rehospitalization rates with UF, although the patients in the CUORE Trial were older and had more severe renal dysfunction at baseline. The CUORE Trial had the longest follow-up period among all UF studies and was able to show that the sustainability of UF’s biologic benefits would translate into pertinent clinical outcomes. The main limitations of this trial are small sample size, inclusion of only patients with heart failure with reduced ejection fraction (HFrEF), and lack of a preplanned algorithm to ensure adequate decongestion for patients receiving medical therapy. Although the UNLOAD Trial compared customized UF with what seems to have been suboptimal medical management, the CARRESS-HF compared marginally applied UF with an efficient stepped pharmacologic therapy. There was clearly an unmet need for comparison of a well done medical management with an effectively applied UF therapy. The Aquapheresis Versus Intravenous Diuretics and Hospitalization for Heart Failure (AVOID-HF) Trial is the most recent RCT that was meant to address this knowledge gap (23). The study was initially designed to include 810 hospitalized patients with ADHF but was terminated before the target enrollment because of a slower than expected recruitment process. As such, despite being the largest study thus far in this field (including 224 patients), its findings need to be interpreted with caution. The AVOID-HF Trial compared early flexible UF therapy with a pharmacologic treatment that was similar to the algorithm used in the CARRESS-HF. For both treatment arms, there were detailed instructions in place so that each therapy could be adjusted according to patients’ vital signs, renal function, and urine output. The UF rate varied from 50 to 300 ml/h (an average of 138 ml/h) for a median of 70 hours. The total and net fluid losses were again found to be greater in the UF group than in the diuretics group (18.7 versus 14 L; P=0.02 and 12.9 versus 8.9 L; P<0.01, respectively) without any adverse effect on renal function (an increase of 0.09 mg/dl in serum creatinine for UF versus 0.05 mg/dl for medical therapy; P=0.88). The patients in the UF arm showed a nonsignificant trend toward better outcomes, such as higher estimated number of days to first HF event (62 versus 34 days for medical management; P=0.11) within 90 days after discharge. Despite early termination of the trial, there was still sufficient evidence to show a number of clinically relevant benefits for UF within the first month of discharge, such as fewer patients readmitted for HF and fewer days in the hospital caused by HF readmission. After discharge, quality of life significantly improved within each treatment group, and the changes were comparable for the two therapies at 30, 60, and 90 days. The investigators did not observe a difference in the length of stay in the index admission or the 90-day mortality rate between the two groups. Of special note, UF was found to be associated with a higher rate of adverse events (see below). Therefore, although the AVOID-HF Trial lends support to the findings of the previous studies with regard to the efficacy of UF therapy in general, it also raises serious concerns about the safety of this procedure. The key strength of the AVOID-HF Trial is its elegant design, providing the possibility of a fair comparison between the two therapeutic modalities for the first time. Its principal shortcoming is the early termination with smaller than planned sample size and also, short follow-up. Moreover, because the investigators could not be blinded to the treatment assignment and because the chosen primary end point (i.e., HF rehospitalization) could be affected by their postdischarge management (unlike the primary end point in the CARRESS-HF), the possibility of an unintentional or deliberate bias may not be eliminated. Finally, similar to the UNLOAD Trial, fluid removal was greater in the UF arm of the AVOID-HF Trial, confirming its higher efficacy but again, raising the question whether equivalent fluid removal would have resulted in similar beneficial findings for UF therapy. The main features of the major UF trials are summarized in Table 3. In general, small sample size represents an important shortcoming of the UF trials to date, which is, at least in part, because of practical obstacles for patient recruitment as discussed below. The small number of patients makes it more difficult to detect smaller differences and also, increases the risk of overestimating the magnitude of an association. For example, although the time to HF event was nearly twice as long in the UF group of the AVOID-HF Trial, the trial was not adequately powered to provide enough evidence for the statistical significance of the observed effect (23). Similarly, hypotension was seen in twice as many patients in the UF arm in the UNLOAD Trial, but it did not reach statistical significance (20). However, the clinical relevance of the minimal changes in renal function that were reported as significant in the CARRESS-HF remains unclear (21). Moreover, the small study population has so far precluded the possibility of identifying certain subsets of patients with ADHF that might be more likely to benefit from UF therapy. It remains to be explored whether the use of nephrology resources could help overcome some practical obstacles of UF therapy (e.g., providing the ability of delivering extended care and clinical coverage by staff and physicians who are familiar with extracorporeal treatments) and lead to meaningful improvement in the recruitment rates. A second shortcoming of the UF trials is that they often did not discriminate HFrEF from heart failure with preserved ejection fraction (HFpEF). Because these subtypes possess distinct pathophysiologic and clinical characteristics, it remains unknown whether they would elicit distinct responses to UF therapy. Overall, it seems that patients with HFrEF have been predominant in these studies, because the baseline ejection fraction of the study populations is often <40% (in the UNLOAD Trial, 70% of the included patients had HFrEF). In the subgroup analysis of the UNLOAD Trial, there was a signal for advantage of UF in patients with HFrEF with regard to HF rehospitalization (20). However, in a nonrandomized prospective cohort study of 184 patients who received UF therapy (53% with HFpEF), the outcomes (e.g., change in renal function and mortality) of patients with HFrEF were reported to be similar to those with HFpEF (24). Finally, the majority of UF trials have excluded patients with hemodynamic instability and those in need of inotrope and vasoactive medications. Therefore, it is unknown whether the findings would apply to this subset of patients. Renal function and decongestion have often been used as end points of safety and efficacy in the UF trials. Emerging data have recently challenged some of these seemingly established concepts, further highlighting a notable gap of knowledge. The variations in renal function during treatment of ADHF represent a complex interplay of several factors, including patient’s HF profile (e.g., arterial underfilling versus venous congestion), disease severity, treatment strategy, and comorbidities. Although it was initially hypothesized that UF could help improve renal function in ADHF through a number of mechanisms, such as improvement in renal venous congestion, studies consistently failed to confirm such a beneficial effect. Most studies showed either no change or even deterioration in renal function (25–27). Moreover, when iothalamate and para-aminohippurate clearance were used to precisely measure renal function, renal plasma flow, and filtration fraction during decongestion, the effect of UF on the kidney was found to be similar to that of diuretics (i.e., a slight decrease in GFR) (28). The effect of WRF on the outcomes of patients admitted for ADHF has also been the focus of attention. Most previous studies identified WRF as a negative prognostic factor in this setting, whereas conflicting findings in recent years imply that WRF might not be a consistent marker of poor prognosis; it can be associated with worse, neutral, or even better outcomes (29–33). In a secondary analysis of the Evaluation Study of Congestive Heart Failure and Pulmonary Artery Catheterization Effectiveness Trial, it was found that WRF during hospitalization could not predict mortality at 60 days (34). Similarly, in the DOSE Trial, WRF was found to be more prevalent in patients with ADHF who received higher doses of loop diuretics, again without portending poor outcomes (e.g., rehospitalization and mortality) (8). Such a trend can also be seen in UF trials as discussed below. The reasons for the apparent disconnect between WRF and outcomes are beyond the scope of this article and have previously been discussed elsewhere (35). There have been proposals for revisiting the use of WRF as an end point in HF trials or changing its current definition (i.e., an increase in serum creatinine level of >0.3 mg/dl or a decrease of 20%–25% in eGFR) in the hope of achieving closer correlation with the outcomes (36–38). The association between renal dysfunction and poor survival observed in HF trials could be contingent not simply on the presence of a reduced GFR but possibly, other factors, such as the mechanism by which deterioration in renal function has developed (see below) (39). Fluid overload is an integral part of the cardiorenal syndrome because of its reciprocal link with both HF and renal dysfunction coupled with its clinical relevance and prognostic value (Figure 1). Congestion remains the primary reason for hospitalization of patients with HF (40). Nevertheless, a significant number of patients is discharged with persistent signs of congestion and without losing significant body weight, presumably contributing to the high readmission rate of ADHF (41,42). As such, the efficacy of the available therapeutic strategies is often determined by how well the patients are decongested during the index admission. 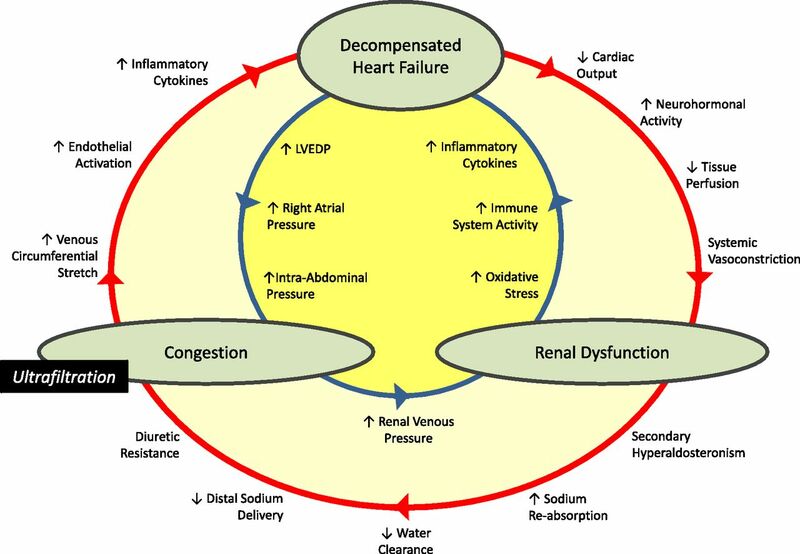 Bidirectional pathways linking heart failure, renal dysfunction, and congestion in cardiorenal syndrome. Decompensation of heart failure can lead to deterioration in renal function via exacerbated neurohormonal activity (i.e., low forward flow) or through fluid overload and renal venous congestion (i.e., high backward pressure). Ultrafiltration could counter these maladaptive interactions mainly through correction of congestion. LVEDP, left ventricular end diastolic pressure. The effect of lingering congestion on prognosis of ADHF has recently been the focus of attention, with a number of observations pointing to it as the primary driver of adverse outcomes. Metra et al. (31) found that patients with ADHF who experienced WRF during admission as well as persistent signs of congestion at the time of discharge had the worst outcomes, whereas WRF alone did not seem to have an effect on their survival. In another study, although patients with adequate decongestion presented more often with WRF, their survival was still significantly improved compared with those with persistent congestion (34). Therefore, the prognostic value of WRF in patients with ADHF seems to be contingent on the presence of congestion. The findings of UF trials further underscore the clinical relevance of decongestion and its preferential salutary effect on the outcomes. In the CARRESS-HF, where weight loss was similar in UF and pharmacologic groups, the mortality rate was also comparable, despite the higher rate of WRF observed with UF (21). In the UNLOAD Trial, where weight loss and net fluid loss were greater in the UF group, despite a trend for WRF, HF readmission rate was reduced with UF (20). Similarly, a trend toward improved prognosis was observed for patients in the UF arm of the AVOID-HF Trial who also experienced more efficient decongestion (23). However, in an uncontrolled study that included patients with ADHF, WRF, and refractory congestion, rescue therapy with UF significantly improved fluid overload, whereas renal dysfunction progressed, and the overall outcomes remained poor (i.e., an in–hospital mortality rate of 30% and 6% discharge to hospice care) (43). This could further highlight the complexity of the interactions between fluid overload, renal dysfunction, and the outcomes in patients with ADHF. Cardiorenal syndrome in general and UF therapy in particular reflect the cardiology-nephrology intersection where collaborative efforts are likely to portend important practical implications. An alarming observation in the AVOID-HF Trial was that a higher number of patients in the UF group experienced “serious adverse events deemed to be related to the study therapy” (e.g., gastrointestinal bleeding and hematuria) compared with those in the diuretic arm (14.6% versus 5.4%; P=0.03) (23). Similarly, more patients in that group experienced an “adverse event of special interest,” such as symptomatic hypotension necessitating intervention, central line–associated bloodstream infection, or bleeding requiring transfusion (31% versus 17%; P=0.02) (23). The increased adverse events associated with UF were also reported in the CARRESS-HF, where a higher percentage of these patients had a serious adverse event, such as bleeding and catheter-related complications (72% for UF versus 57% for medical therapy; P=0.03) (21). These observations should remind physicians that, despite remarkable technologic progress in the manufacturing of the newer UF devices, this modality does remain an invasive procedure with potentially serious complications. UF procedures in these trials were largely performed by cardiologists, and the reported complications were among those commonly encountered in patients receiving RRT (44). It remains to be tested whether increasing the involvement of nephrologists in the delivery of UF therapy would have incremental benefit on reducing the complications. UF profiling and real-time monitoring of intravascular volume are among the commonly used methods in the dialysis units. In the author’s opinion, the need for training of physicians and staff as part of a comprehensive HF program represents an often overlooked aspect of UF procedure, potentially portending quality of care implications and financial consequences (see below) (44,45). The significant economic burden resulting from HF-related morbidity and mortality is well known and common to all health care systems. Total costs for HF are estimated to increase from $31 billion in 2012 to $70 billion in 2030, and the majority of the expenditure (i.e., 80%) is related to hospitalization (2). It has been hoped that UF therapy, although expensive, could be helpful in lowering the cost in the long run by virtue of its higher efficacy. The price of the UF supplies should, indeed, be balanced against the financial reimbursement (i.e., diagnosis–related group payment) and potential savings from reduced length of stay and readmissions. However, UF is unlikely to result in cost savings when cardiology devices and proprietary supplies are used (46). It needs to be assessed whether using already existing nephrology resources (e.g., nursing support and disposable supplies) would be financially advantageous by lowering the upfront cost, while still providing the persistent benefits of UF on HF-related events (47). Finally, financial analyses are further confounded by the fact that readmission rates for HF are increasingly regarded as a quality metric and being used to define reimbursement rates and penalize underperforming facilities (i.e., readmission–based financial incentive/disincentive programs) (48). Because of conflicting findings of the most recent trials coupled with their perceived shortcomings, the precise role of UF therapy in the management of ADHF remains unclear, and the opinions of the experts are still sharply split. Although the efficacy of this treatment modality is increasingly recognized, serious concerns have recently been raised about its safety. This costly therapy seems to be associated with improved medium–term outcomes within weeks to months after UF therapy (e.g., reduction in HF rehospitalization), but so far, there is no evidence of long–term survival benefit. As such, when considering UF therapy, possible risks should be carefully balanced against its likely benefits for an individual patient. On the basis of the available literature, it seems prudent to limit the use of UF to those patients who are fluid overloaded and experience diuretic resistance, especially if they have a history of frequent HF readmissions and suboptimal decongestion. The therapy seems to be more beneficial if applied early in the course of hospitalization, with a flexible regimen that allows customization of the procedure to the clinical characteristics and therapeutic needs of each patient. In the author’s opinion, collaborative HF programs combining cardiology and nephrology expertise could prove helpful in the practice of extracorporeal therapies. The guidelines provided by the professional societies, summarized in Table 4, in general advocate the use of UF therapy in patients with HF who present with lingering congestion and diuretic resistance (49–52). Future studies are needed to fill the current gaps in knowledge. In addition to large-scale trials that explore the superiority of one modality over the other, there is a need to identify the potential subsets of patients with ADHF that are more likely to benefit from this therapy (e.g., patients with more pronounced right–sided HF and venous congestion). The majority of UF trials have so far used clinical markers of congestion to guide therapy. Applying more robust methods for objective assessment of decongestion (e.g., serial or in-line monitoring of hemoconcentration, thoracic impedance monitoring, measurement of inferior vena cava diameter by ultrasound, and serial measurement of B–type natriuretic peptides) is likely to improve the design and quality of these trials. The definition and implications of changes in renal function in the setting of ADHF also need to be revisited; until there is a better understanding of the precise interplay among WRF, congestion, and clinical outcomes, it would be preferable to avoid considering WRF as an independent primary end point. Finally, it can be tested whether implementation of interdisciplinary HF programs and involvement of nephrology services would have salutary effects on patient recruitment and adverse events.